Figure 1. Image Credits: NASA/JPL-Caltech/SwRI/MSSS/Kevin M. Gill https://www.nasa.gov/image-feature/jpl/dark-and-stormy-jupiter. As the biggest planet in our solar system, Jupiter has sparked the curious minds of people for centuries. Among the many mysteries surrounding Jupiter, its interior remains one of the most fascinating secrets that we seek to understand. Although there is no certainty, it is widely accepted that Jupiter has a core and we will explore theories about its composition that support this theory. The spacecraft, Juno, is currently orbiting Jupiter to delve deep in discovering the planet’s evolution and atmosphere, sending back information that continues to amaze peoples minds. Jupiter’s core and composition will be assessed to determine what really lies in Jupiter’s interior and for the possibility of the core being composed of dense materials instead of solids. The history of how our solar system has formed remains a challenge to explain as we are unable to study the process itself. 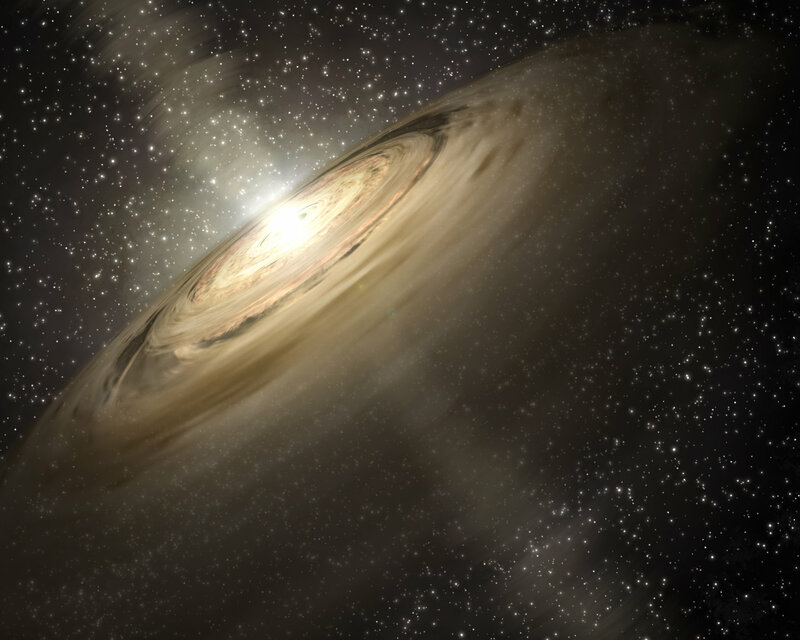 The current understanding of the theory for the formation of planets is related to that of stars and the overall creation of the solar system. 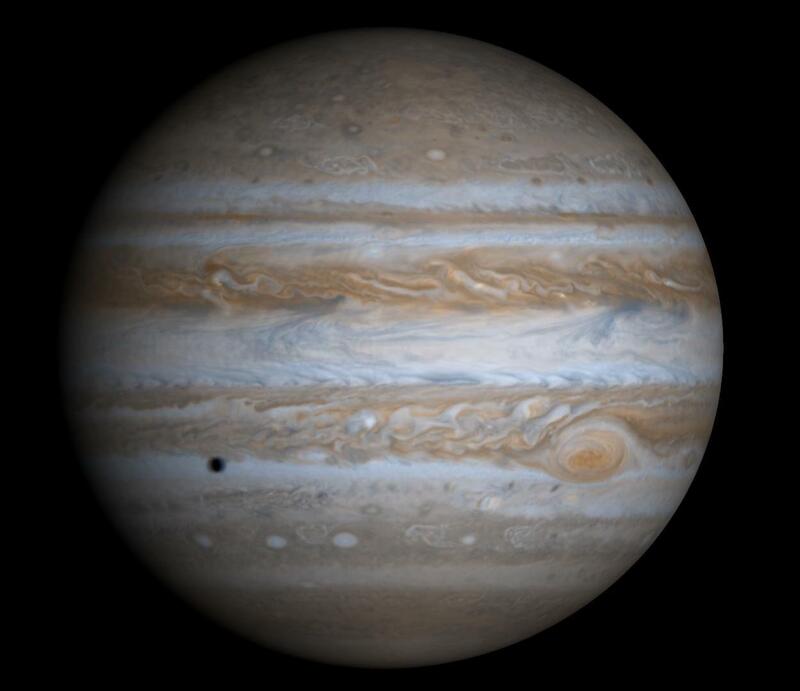 It was theorized that after Jupiter formed, it had migrated closer and then farther away from the Sun. This path that Jupiter took is called the Grand Tack. 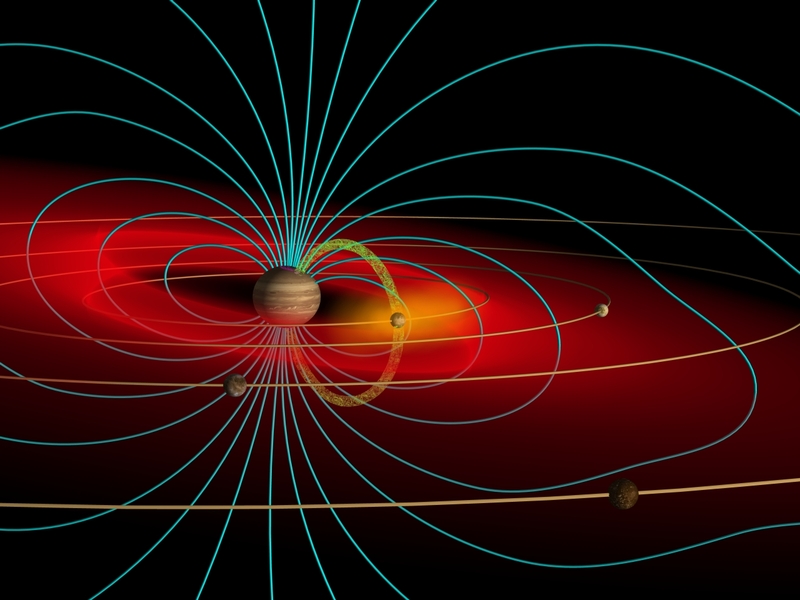 According to this model, Jupiter was likely formed around 3.5 AU from the Sun, however, but the wild currents of gas and dust particles caused the planet to roam as close as 1.5 AU, the orbit that Mars is currently in.8 Saturn also followed this pattern before all of the dust particles between them were driven out and the two planets’ bound paths became inverted.8 The end result of this migration placed Jupiter where it currently resides, at 5.2 AU from the Sun. As Jupiter was the first planet formed in our solar system, the planet could contain many answers to the mysteries of what our solar system and its planets are composed of. With many elements pertaining to Jupiter that remain unknown, there are ongoing efforts to seek explanations. When seeking to understand what Jupiter’s core could be composed of, it is important to look at how a gas giant is formed. 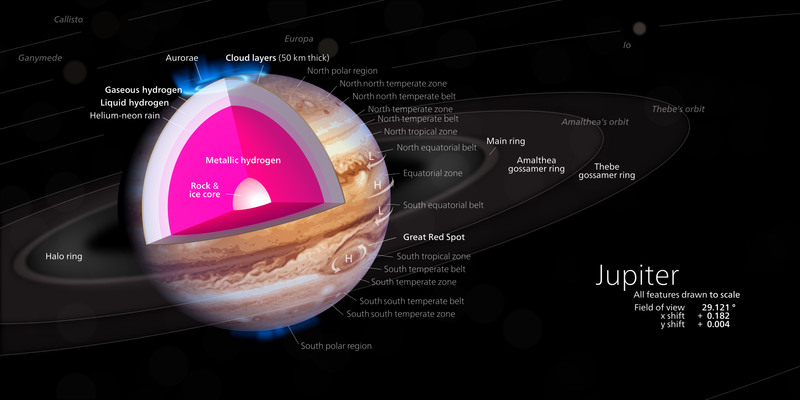 Information such as where Jupiter may have originally been formed, its atmospheric and central composition, elements such as metallic hydrogen and Jupiter’s magnetosphere and the multitude of possible theories can help contribute to Jupiter’s interior. With Juno’s ongoing mission to orbit Jupiter until 2021, we can potentially learn what Jupiter’s interior contains and finally have an answer for one of the greatest mysteries of our solar system. 1 NASA, Jupiter: In Depth, https://solarsystem.nasa.gov/planets/jupiter/in-depth/ (Accessed 9 June 2018). 2 NASA, The Atmosphere of Jupiter, https://www.missionjuno.swri.edu/jupiter/atmosphere?show=hs_jupiter_atmosphere_story_what-is-jupiters-atmosphere-made-of. (Accessed 12 June 2018). 3 D.J. Stevenson, Earth and Planetary Science Letters 208, 1 (2003). 4 C.A. Jones and R. Holme, Geophysical Research Letters 44, 5355 (2017). 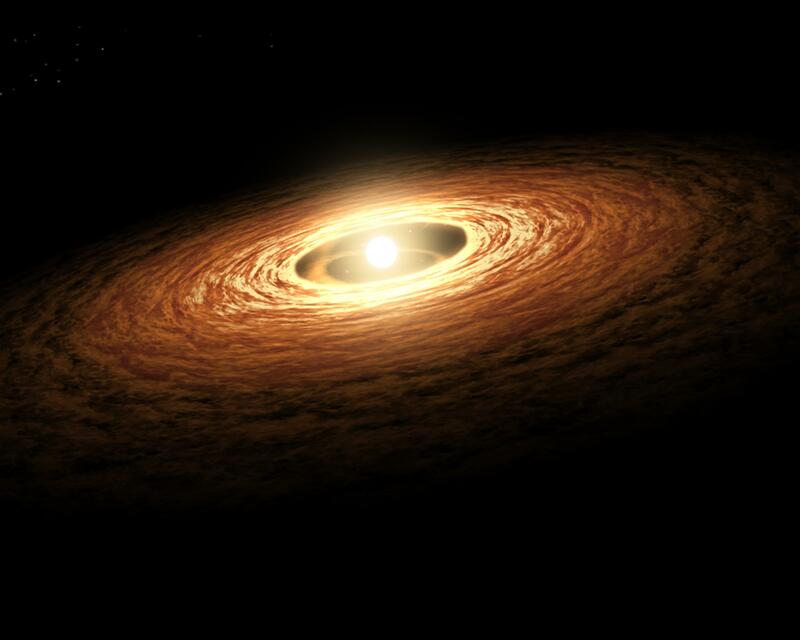 5 NASA, HubbleSite, Discovering Beyond: How do Planets Form? http://hubblesite.org/hubble_discoveries/discovering_planets_beyond/how-do-planets-form. (Accessed 2 June 2018). 6 J.P. Williams and L.A. Cieza, Annual Review of Astronomy and Astrophysics 49, 67 (2011). 7 J. Bennett, Popular Mechanics, 167 (2017). 8 NASA, Jupiter’s Youthful Travels Redefined Solar System, https://www.nasa.gov/topics/solarsystem/features/young-jupiter.html (Accessed 12 June 2018). 9 K. Batygin and G. Laughlin, Proceedings of the National Academy of Sciences of the United States of America (2015). 10 S. Ginzburg and R. Sari, Monthly Notices of the Royal Astronomical Society 469, 278 (2017). 11 NASA, What’s in Jupiter’s Core, http://www.missionjuno.swri.edu/origin?show=hs_origin_story_whats-in-jupiters-core (Accessed 10 June 2018). https://source.wustl.edu/2004/12/space-scientist-proposes-new-model-for-jupiter-core/ (Accessed 10 June 2018). 13 S. L. Li, C. Agnor, and D. N. C. Lin, The Astrophysical Journal 720, 1161(2010). 14 H. F. Wilson, and B. Militzer. Physical Review Letters 108, (2012). 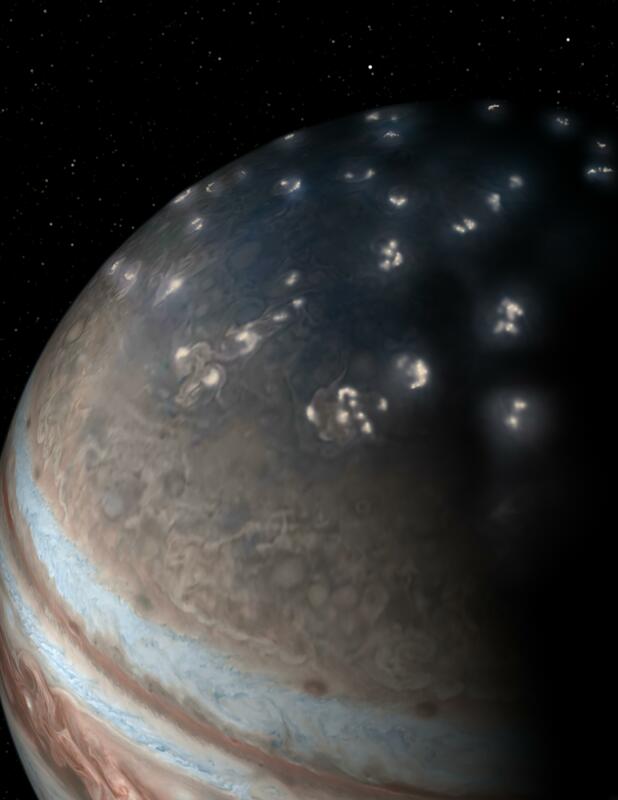 15 R. Sanders, Jupiter’s Rocky Core Bigger and Icier, Model Predicts, https://www.berkeley.edu/news/media/releases/2008/11/25_core.shtml (Accessed 14 June 2018). 16 Forbes, Is Metallic Hydrogen Possible, https://www.forbes.com/sites/quora/2017/10/30/is-metallic-hydrogen-possible/#4e9ad02e343d (Accessed 14 June 2018). 17 NASA. Jupiter: In Depth, https://solarsystem.nasa.gov/planets/jupiter/in-depth/ (Accessed 14 June 2018). 18 NASA, Mission, https://www.missionjuno.swri.edu/mission/ (Accessed 5 June 2018). 19 NASA, Launch, https://www.missionjuno.swri.edu/launch (Accessed 5 June 2018). 20 NASA, Deploy the Craft, https://www.missionjuno.swri.edu/deploy-the-craft (Accessed 5 June 2018). 21 NASA, Earth Flyby, https://www.missionjuno.swri.edu/earth-flyby. (Accessed 5 June 2018). 22 NASA, Orbit, https://www.missionjuno.swri.edu/orbit (Accessed 5 June 2018). 23 NASA, News: Juno Provides Infrared Tour of North Pole, https://www.missionjuno.swri.edu/news/juno-provides-infared-tour-of-north-pole (Accessed 5 June 2018). 24 NASA, News: Juno Solves 39 Year Old Mystery, https://www.missionjuno.swri.edu/news/juno-solves-39-year-old-mystery (Accessed 6 June 2018). 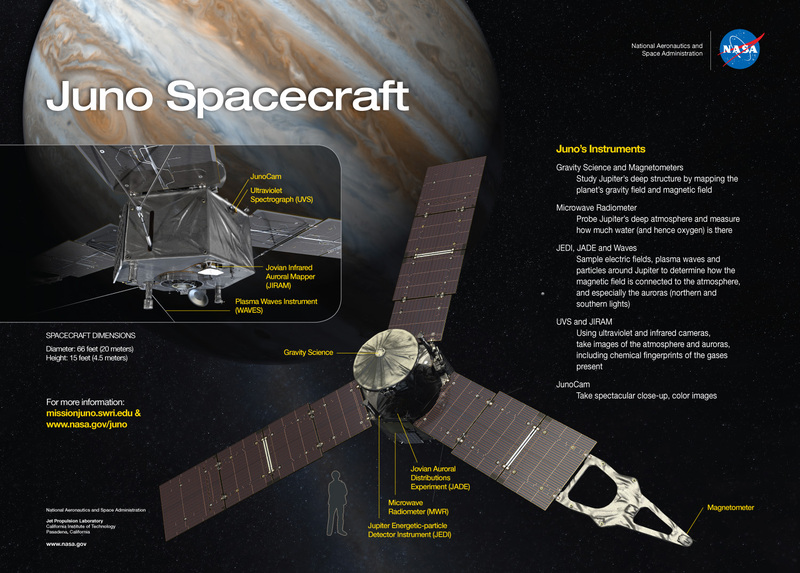 25 NASA, News: NASA Replans Juno’s Jupiter Mission, https://www.missionjuno.swri.edu/news/nasa-replans-junos-jupiter-mission (Accessed 14 June 2018).